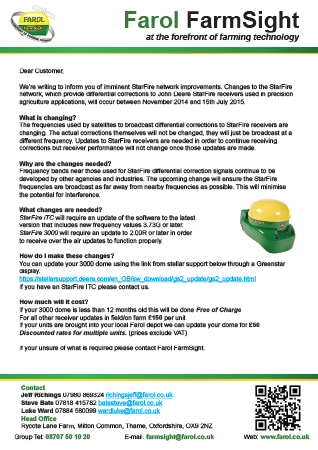 As part of their ongoing update program to make sure customers have access to the best available technology, John Deere are allowing existing SF2 users to upgrade their activation from Gen 2 iTC to a 3000 dome. iTC domes still running SF2 after November 2015 will still be able to purchase SF2 subscriptions from Stellar, but will NOT be able to upgrade after this point. After November 2015 if the upgrade has not been carried out, a new Gen 3 license would be required at full retail. Call us today on 01844 278843 and press option 6 to speak to our FarmSight department and book your upgrade. Between November 2014 and 15th July 2015, the frequencies used by satellites to broadcast differential corrections to StarFire receivers are changing. Updates to StarFire receivers are therefore needed in order to continue receiving corrections, but performance will not change once those updates are made. Please click the picture below to view our letter with all the information you will need on this update.